White styrofoam head. Can be used in the wig carrying box or for styling the wig. Short, mid length, straight layered, classic style premium quality wig by Wig Pro. Featuring a light weight open cap. completely natural looking! Cap Size: Average Length: Front 5" • Sides 4 1/2" • Nape 4 1/2" Weight: 2 1/4 oz See item details for available colors. Please allow one week for special order colors. Three straight layered wefts of hair, attached to a claw clip, which is three inches in length. The length of hair is 10 1/2 inches. See item details for available colors. Ultra light weight premium construction exemplifies this top of the line wig. Long wavy layered glamorous shag hairstyle. Reminiscent of an edgy rocker look! See item details for available colors. Jon Renau Haute! Poshly polished or tightly curled, this classic chin length bob can be worn as it comes ready to wear or styled with heat, thanks to HD heat defiant fiber. The SmartLace cap construction creates a perfectly natural hairline for a flawlessly beautiful look. Jon Renau Lily! 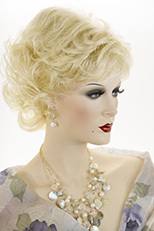 This wig has the romantic beauty of short, wavy layers with the easy wearability of O'solite construction, a perfect pairing of comfort and carefree style. Feminine and chic! This striking short straight wig, tapers at the nape with length around the sides of the bangs which can be swept forward for a feminine look. See item details for available colors. Classic and timeless! 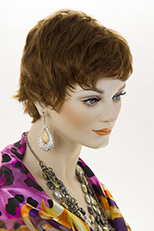 A lovely human hair collar length shag style wig, which is flattering to almost any face shape! See item details for available colors. 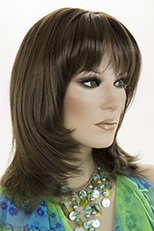 Youthful mid length straight layered flip style wig with bangs. See item details for available colors. 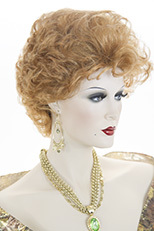 Glamorous, premium quality,medium, long length, wavy, lace front wig! Length is 17 inches. The hair is made from the finest Futura heat friendly fiber. Futura by Kanekalon enables you to re-style and change up your look effortlessly. Curl, flat iron, blow dry and re-style again and again. Futura’s breakthrough high heat resistance technology can safely handle temps up to 377°. 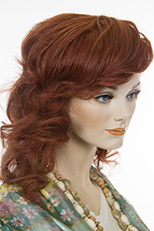 The lace front allows you to wear you hair swept back revealing a completely natural looking hairline and forehead. See item details for available colors. Please allow ten days for special order colors. Jon Renau Sabrina! Cute and perky, this medium length shag is an ever-popular look. The cascading layered cut creates great natural movement, while O'solite construction keeps you comfortable. Premium human hair scrunchie, hairpiece, short curly pony tail holder with hair which is 3" in length. An excellent way to quickly create more volume and length for a pretty fluffy chignon look. See item details for available colors. Premium quality, glamorous, lace front,natural looking hairline, long, straight, wavy, heat o.k. wig! Length of hair is 32 inches. The hair is made from the finest Futura Kanekalon fiber. Futura by Kanekalon enables you to re-style and change your look effortlessly. Curl, flat iron, blow dry and re-style again and again. Futura’s breakthrough high heat resistance technology can safely handle temps up to 377°. See item details for available colors. Sensitive scalp or don't like the feeling of pressure on the perimeter of your head when wearing your wig? whether you have hair or not the comfy grip was designed to make wearing a wig or hat during hair loss more secure, confident and comfortable. It adjusts to body movements, distributes the weight of a wig or hat evenly and keeps them from slipping. If you have hair, the comfy grip deluxe has a pebbled side which is worn on your hair. If your scalp is free of hair, the smooth side is worn next to your scalp. The pebbled side grips your wig better. Never wear it tight, the wonderful material, which is a cool skin like texture will stick to your scalp like and adhesive, without being sticky. 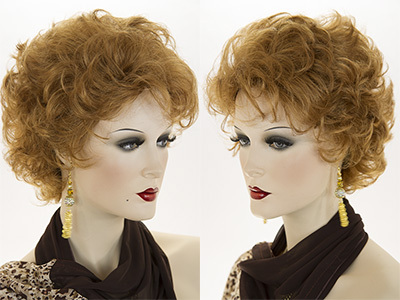 Mid length layered mullet style costume wig! Shorter layers on the top with length on the bottom to the shoulders. Small baby hairs on the hairline making this a very natural looking wig. See item details for available colors.